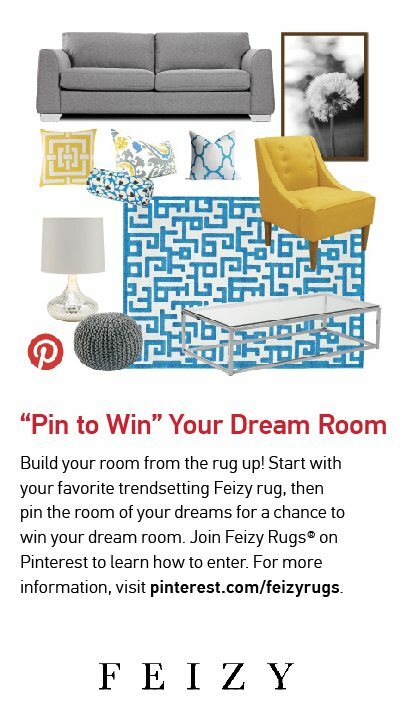 DALLAS, TX – Oct. 21, 2014 – Feizy Rugs is giving their followers a chance to win their dream room by building it from the rug up in their “Pin Your Dream Room” contest on Pinterest. Running now through November 14, contestants will be asked to visit Feizy Rugs on Pinterest, pick their favorite Feizy rug and build their dream room for an opportunity to win. Contestants may submit a maximum of one entry per person. Entries will be accepted through November 15th at 12:00 pm. Winners will be chosen based on design continuity and creativity. The first prize winner will take home the Feizy rug in their dream room plus $1000, with second and third prize winners receiving the Feizy rug in their dream room and $500 and $250 respectively. For more information or to enter the Feizy “Pin Your Dream Room Contest”, please visit Feizy Rugs’ on Pinterest http://www.pinterest.com/feizyrugs/feizy-dream-room-contest/. Previous articleWith so many amazing new rug intros, it’s okay to get a little excited…we are!